This weekend we found out firsthand what happens when a rabbi and a priest get together in Rhinebeck, New York. 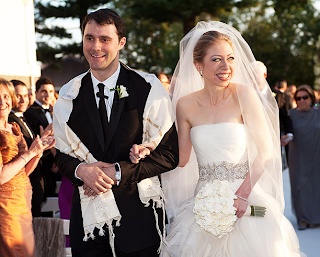 Officiated by the two holy men, former first daughter Chelsea Clinton married her longtime beau Marc Mezvinsky. The wedding of the interfaith couple (he's Jewish, she's Methodist) was the presidential event of the summer as 400 family and friends attended the anticipated event. In the public eye since she was a teenager, Chelsea has her parents' high profile careers to thank for her magnificent wedding. No expense was spared in making their only child feel like a princess on her big day. The bride's Vera Wang dress and her mother's Oscar de la Renta couture were the fashion highlights of the night, while a solemn looking Bill looked dapper in his suit. 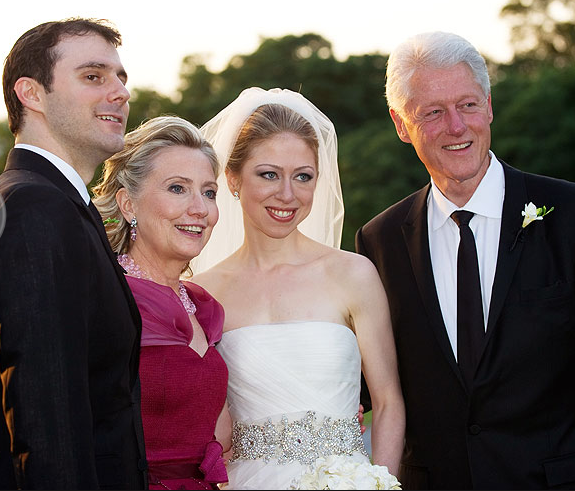 The official wedding announcement was sent shortly after the ceremony, via a joint statement from President Clinton and Secretary of State Clinton: "Today, we watched with great pride and overwhelming emotion as Chelsea and Marc were wed in a beautiful ceremony at Astor Courts, surrounded by family and their close friends. We could not have asked for a more perfect day to celebrate the beginning of their life together, and we are so happy to welcome Marc into our family. On behalf of the newlyweds, we want to give special thanks to the people of Rhinebeck for welcoming us and to everyone for their well-wishes on this special day.